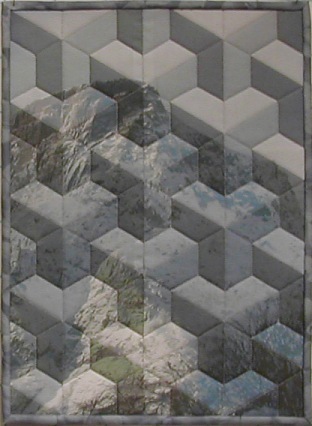 All the quilts below have pictures printed on fabric in them. 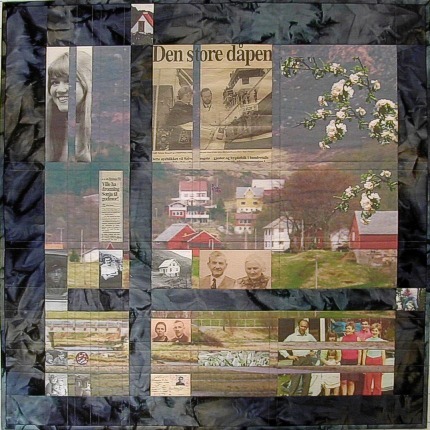 A photo of the recipients childhood home and neighbourhood is used as a backdrop, and photos representing relatives and memorable occasions are set into a grid resembling a weaving pattern. Made as a gift to a relative. Different parts of the portrait printed on various fabrics and then pieced together. 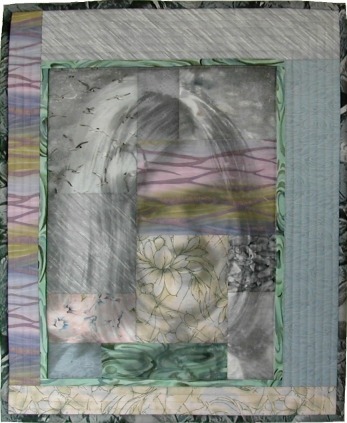 The fabrics have sunset skies, sea birds, storm clouds, rain drops and slanting rain, flowers, rocks, and water puddles on them, and these patterns show through the printed photo. 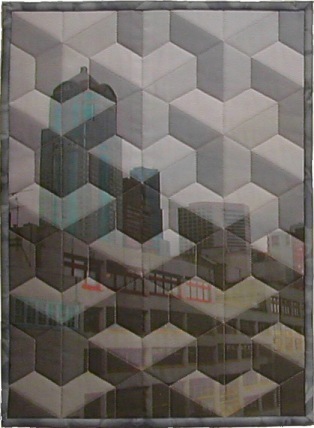 The quilts are made in the 'Inner city' pattern using dark, medium and light versions of the same photos. To the left is part of a city center (Pike fish market in Seattle), and to the right is the mountain Hornelen clad in snow, - also called a 'Troll Cathedral' by Jakob Sande, one of Norway's poets. This quilt was commissioned by Bremanger Arts and Crafts Association as a gift to 'Haugetun', a collective for the elderly in the village. 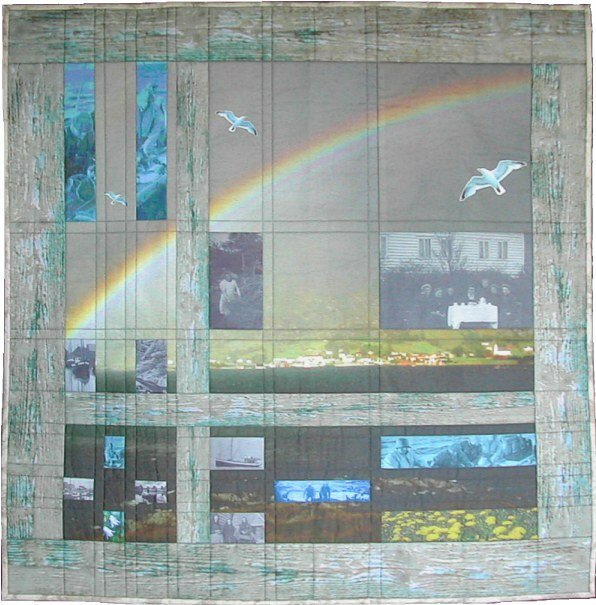 The main motif is the Bremanger village crowned by a rainbow. The smaller pictures are old photos of local people going about their daily work in their fishing boats and on farms. On Sundays they dressed up and socialized, no matter how busy they were. Just as the rainbow is a sign of blessing, the older generation laid the fountations for the welfare society which we are blessed with now. 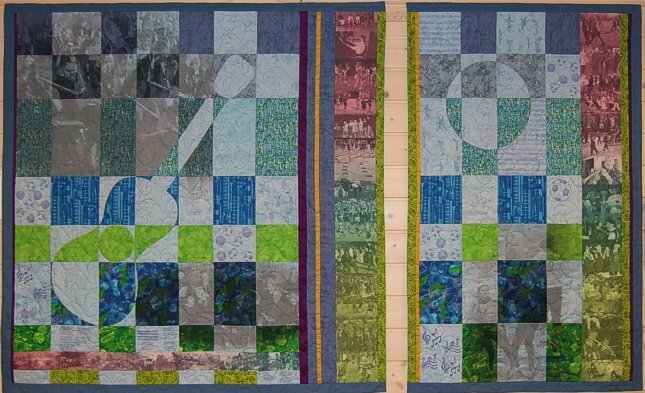 Large quilt in two panels commissioned for a new sports hall. Hanging together, the two panels measure approx. 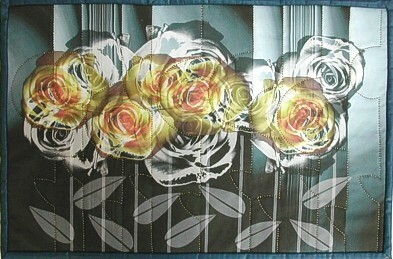 2,75 m x 1,65 m.
Have a closer look here.